Tiger Muay Thai and MMA training camp fighters, Phuket, Thailand went 2-1 @ Bangla Muay Thai stadium in Patong on May 7, 2009. Cyrus Washington, making his return to Tiger Muay Thai scored a 2nd round KO over Jumbo-a using his mix of Tae kwon Do / Jeet Koon Do / Muay Thai. Cyrus is in training for nest seasons Muay Thai contender Asia tryouts. 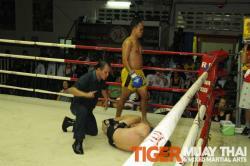 Orono, in his first fight for Tiger Muay Thai, took on tough veteran fighter Michi. While Michi has the heart of a lion and never backs down from a quality opponent, the legend, Orono, was too much for as Orono scored a 3rd round KO. Orono will be fightinging on international television and Bangkok TV 7 on next week representing Tiger Muay Thai. Veronika took on one of Rawai’s best fighters in Nam Wan. In an exciting fight, Veronika lost a decision to Nam Wan over 5-rounds.